Best moment: Alford’s best moment didn’t occur on the basketball court. 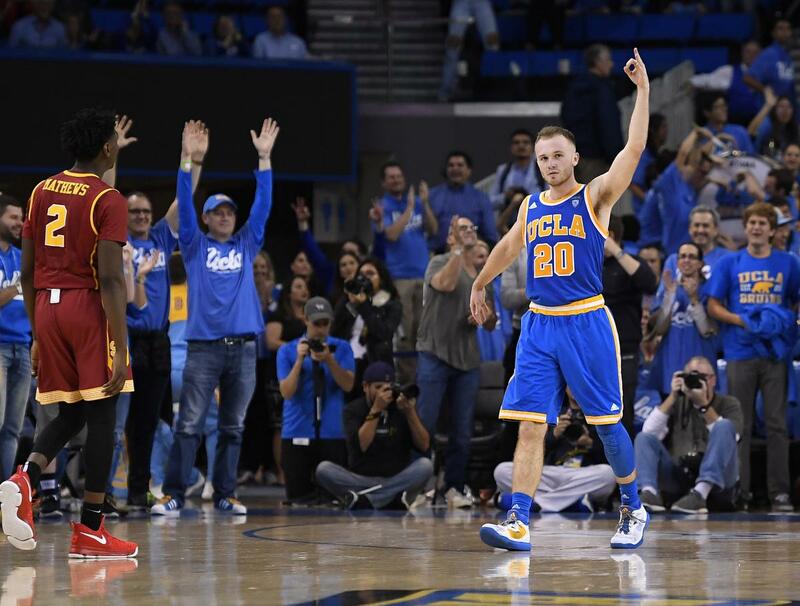 It happened in the Galen Center locker when he called a team meeting at UCLA’s lowest point of the season. He flexed his muscle as a leader after the Bruins’ only two-game losing streak of the season was punctuated by a Jan. 25 loss at USC. The team meeting was often credited for the rise of defense among the Bruins’ priorities, something that revealed itself during the 10-game winning streak that followed. Worst moment: One of Alford’s worst games of the season was the one that likely sealed the Bruins’ fate as a No. 3 seed in the NCAA tournament. In UCLA’s loss to Arizona in the semifinals of the Pac-12 tournament, Alford was just 2 of 12 from the field and 1 of 10 from 3-point range. His five points was the second-lowest total of the season for Alford at a time when TJ Leaf’s sprained ankle rendered him less than full strength and Lonzo Ball was struggling with a thumb injury. Arizona won the conference tournament and earned a No. 2 seed in the West while UCLA was the No. 3 seed in a South region that landed them in front of a pro-Kentucky crowd, where they lost in the round of 16. Summary: It’s hard to say Alford didn’t maximize his potential at UCLA, where he leaves the school fifth on its career scoring list and as the only player in school history with 1,700 points and 500 assists. When he was finally displaced by a true point guard and played the role he was intended for as a senior, Alford was exceptional as a shooter, providing something every elite team needs on its wing. His defensive shortcomings were part of what cost UCLA the chance to become championship material, but he made up for some of it with leadership and moxie on a team full of soft-spoken players. His career arc is something of a marvel considering the mental toughness required for the coach’s son to prove he even belonged on a Division I college basketball court, much less at program like UCLA. Future outlook: Alford simply isn’t athletic enough to be considered NBA material, despite his accomplished record as a shooter. Perhaps he has a chance to play overseas, but it’s difficult to picture him making a roster in a high-level league. His older brother Kory has already gone the coaching route as UCLA’s video coordinator. Alford hasn’t shed much light on his future or his desire to try and play or coach professionally. This entry was posted in Basketball and tagged Bryce Alford by Clay Fowler. Bookmark the permalink. I think that’s a pretty fair assessment. Bryce-haters are going to hate, but I think the kid did about everything he could for the team … he played hard, played where he was asked to play, and was by all/most accounts a very good teammate. Sure he made some bad BB decisions in games along the way, but his often clutch shooting more than made up for those IMO. A good and true Bruin who I hope will be remembered in a positive light in future years. Using the same grading criteria, I wonder how some of the other notable UCLA shooting guards of the last 40 years with average-to-below-averge defensive skills would rate? Brad Holland, Toby Bailey, Jason Kapono and Michael Roll come to mind. I’d take any of those four ahead of Bryce Alford, with the possible exception of Michael Roll. However, Roll played better defense and FAR less minutes than Bryce. He was not the focal point of the team as Bryce was for his Sophomore and Junior seasons. Kapono was a poor defender that played for several years in the NBA. Bailey? Not even a close call. Brad Holland….all day long over Bryce. Bailey was multi-dimensional on offense (could shoot and drive/finish at the rim) and played good D.
I don’t think that I disagree … I wasn’t suggesting that Bryce was necessarily ‘better’ than any of those mentioned … just pondering how much higher those guys might be graded. Much as I liked them, I recall Roll and Kapono constantly getting beat off the edge by much quicker attackers much like BA. Toby was certainly the most multitalented of this group. Brad was the 1st SG that I watched at UCLA … with no shot clock and no 3-pt line, it’s a little harder to directly compare his game to some of the others, but he was a special player and one of my early favorites! Factoid: Did you know that Michael Roll became a naturalized citizen of Tunisia in 2015 and was on their national BB team? One point missing is that Bryce played PG and not SG for most of his career. That is where much of the antipathy came from, which was a big mistake on the part of his father. I think I do remember that about Roll. Kapono was merely a roll player as a spot up 3 point shooter in the NBA. He definitely was not a defender. Brad Holland wasn’t a gunner in college. Good team player. You could also blame Bryce’s poor shooting games – such as this past March – on Lonzo. Lonzo was slacking off as his head was on the NBA, not UCLA. UCLA’s offense was terrible the whole month because of Lonzo’s mediocre play. If you’re saying that the team’s fortunes rested squarely on the shoulders of Lonzo Ball, I agree.